It’s a frequent flyer’s worst nightmare – trapped inside a plane in mid air that suddenly plummets towards the earth at an uncontrollable speed which is exactly what happens in new Paramount Pictures movie “Flight” directed by Robert Zemeckis, starring Denzel Washington, John Goodman, and Don Cheadle. Washington plays a self-indulgent character named Whip Whitaker that has an addiction to alcohol who happens to be a commercial pilot. During a flight, Whitaker gets his crew and passenger on the plane through a bad weather storm consisting of extreme turbulence. Once pulling the plane successfully through it, Whitaker gloats to his passengers while sneaking a couple of mini-vodkas with orange juice before going back into the cockpit with a fairly new pilot. It seems to be smooth sailing from there on out, until the plane starts to lose pressure and starts to plunge to a rapid descend. Going on pure “instinct” Whitaker would later say in a hearing, he flipped the plane upside down in order to bide some time for a smoother than ordinary landing into an open field which ironically was the grounds of a church with members praying as the plane fell down. Upon the plane’s safe landing which took lives of three plane crew members and four passengers, it is quickly discovered that no other pilots tested in the same conditions could land the plane safely. His new found heroism is spiked with a personal addiction that he isn’t aware that he has. After missing various signs along the way that he needs help, Whitaker reaches his personal rock bottom moment inside of a hotel room the night before his hearing to convince his innocence of any negligence to the panel. His moment of clarity comes in an unexpected place and a very well played, suspenseful scene at the end of the film . Denzel Washington is truly dedicated to his character Whip Whitaker. 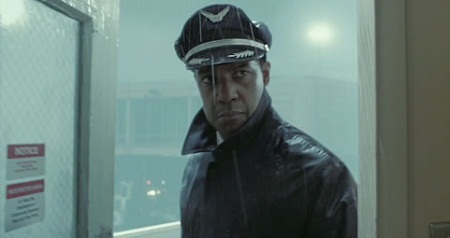 So much so that you forget you are watching Denzel Washington play this part. He really becomes Whip in the film. Other strong performances included John Goodman (“the mobile 7-11”), Keilly Reilly who plays Whitaker’s love interest, Don Cheadle who portrays the lawyer that is brought-in by the airline union for his trail, and Charlie Anderson who plays Whitaker’s union rep.
“Flight” is an incredibly strong character piece with real human stories and emotion. Whip is the dark horse that you shouldn’t be rooting for, but you are. When he finally takes responsibility for his actions knowing what the consequences are, it’s this raw realism that makes the movie that much more intriguing and powerful while giving every viewer something that they can relate to. It’s these moments in each individuals’ life that defines their character. For Whip, he ends up gaining more respect for it.